With a large number of artists currently in Calgary without shows and others traveling out of the city, a number of performances have begun popping up in Calgary, Edmonton, Vancouver and other nearby cities. 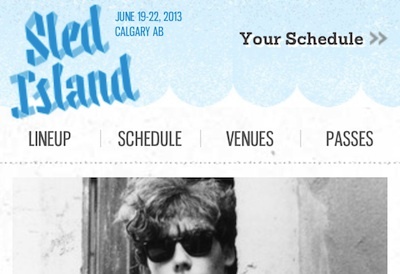 Unfortunately, Sled Island 2013 remains cancelled. However, in this difficult time, there has been an overwhelming outpouring of support from venues (traditional and non-traditional) outside of evacuation zones, festival partners and residents of Calgary and nearby cities to arrange alternate plans for these and other artists. While Sled Island 2013 is cancelled, live music continues to find a way to make its importance felt. The incredible communities that support live music throughout the year continue to surprise and humble us all, making the best of a bad situation. With the Sled Island office evacuated, limited resources and inconsistent access to phone and internet, we are unable to keep all updated on the inspiring concerts and intimate performances happening in the face of a terrible situation. However, we feel it is imperative to acknowledge the impact live music can have on people on trying times and the incredible work that people have done to facilitate it happening. If you are an artist, attendee or show promoter with a live music event taking place, we encourage you to let people know on our Facebook page. If you choose to partake in live music in the coming days, we urge you to do so safely and full-heartedly. The Sled Island team is overwhelmed and touched by the efforts of all who have contacted us and our artists this week. Thank you all. We love you. In light of the current emergency situation, and in line with our commitment to the safety of festival-goers and the citizens of Calgary, all remaining Sled Island festival events are cancelled. We have been fortunate to be able to hold two successful days of the festival and we thank attendees for their enthusiasm and flexibility. In terms of our policy on passes and tickets, we ask for patience and understanding until we are able to address this in the days to come. We realize that there will be many questions to be answered from festival-goers, artists and partners. The Sled Island office in Mission has been evacuated and we are operating with limited resources. Our commitment to the safety of the citizens of Calgary remains paramount. Please take care of your friends and family who may require assistance and stay safe. Dear Sled Island festival goers. Today we, like many Calgarians, were hit by some unexpected events. Neighbourhood evacuations in Calgary, including our office and many of our festival venues, along with road closures outside of Calgary, caused a number of show cancellations and/or last-minute moves. We have been humbled by the positivity and understanding of crowds, the go-with-it attitude of our artists and inspired by our partners' initiative to make tonight roll as smoothly and as close to as scheduled as possible. We have received tons of questions about our plans for the weekend. We are in close discussions with city officials and have every intention of getting the word out as soon as we know what is and is not possible for the remainder of the weekend. We expect to have a lot more information by Friday morning. Festival-goers and artists' experience and safety are of primary importance to us, so we want to ensure that the weekend's plans are respectful of both of those things. Thank you, from the bottom of our hearts, for your patience, understanding and continued support. Let's get through this together! Hey all, due to neighbourhood evacuations, there have been some changes to the Thursday, June 20th schedule. Unless listed below, all Sled Island shows will continue as normal. The following shows have changed. Superchunk, THEESatisfaction, Roaming Storms and Hooves show has been moved from Republik to Flames Central. John K. Samson, Northcote and Hannah Epperson show has been moved from Ironwood to The Globe Cinema. Dead Soft, Bestie, Sunshine show has been moved from Bamboo to Local 510. East Village Block Party at East Village's Riverwalk Plaza has been cancelled. Jerusalem In My Heart, Pete Swanson and Eric Chenaux show at National Music Centre has been cancelled. Dragon Fli Empire, Obey The Crooks, Cove Tpada and RapX show at the New Black has been cancelled. The Night Marchers, Dent May, Lab Coast and Calvin Love show at Golden Age Club has been cancelled. The Highest Order, The Bitterweed Draw and Old Man Markley show at Ship and Anchor has been cancelled. White Lung, Skip Jensen, Young Braised, Ben Caplan and B-Lines have cancelled their performances, replacement info coming soon. Slow Learner are now replacing White Lung at Broken City. Broken City: LBJs at 10pm, Grown-Ups at 11pm, Crystal Swells at 12:30pm and Slow Learners at 1:15am. Doors at 9pm. Globe Cinema: Hannah Epperson at 10pm, Northcote at 11pm, John K. Samson at 12am. Doors at 10pm. We had not anticipated the neighbourhood evacuations - please do accept our humblest apologies and thank you for understanding. Should any refunds be required, we will be in touch shortly. East Village Block Party is Back! It was an incredible first night to Sled Island 2013! Colin Stetson blew minds at a packed Commonwealth, Swans crushed their epic two hour set, Unknown Mortal Orchestra put on a clinic for all those at Broken City, The Gaslamp Killer had everyone bouncing off the walls and Ice Age delivered a powerful cap to a flawless night at the No. 1 Legion. All that and we're just getting this party started! It's back! The East Village Block Party is going down today from 4-10pm at the East Village's Riverwalk Plaza. That's six straight-hours of the best electronic dance music from likes of Crimson, Kingdom & Kelela, Drop The Lime and more, an outdoor beer garden, a special edition of the Market Collective plus YYC Food Trucks. Let's collectively will the rain away with dancing and drinking! We've also got a jam-packed night of club shows including a couple of sure-to-be legendary performances by The Jon Spencer Blues Explosion at the No. 1 Legion and Superchunk at Republik. Don't miss National Music Centre residency act Jerusalem in My Heart perform their unique blend of an audio-visual experience. We've just announced heavily-hyped The Night Marchers featuring 3/4 members of Hot Snakes are replacing Mac DeMarco (had to cancel due to personal emergency) to headline at Golden Age Club for the venue's debut. Comedy starts with two shows, one at the Fairmont Palliser Crystal Ballroom and the other at Wine-Ohs. All that plus SUUNS at Palomino, White Lung at Broken City and much more. As always there's tons of great stuff to discover during the festival. Look out for Ben Caplan at Ironwood, local sensation Mark Mills at the East Village Block Party, feel-good punks The Courtneys at Tubby Dog followed by a screening of Quintron and Miss Pussycat's The Mystery in Old Bathbath. Looking for something more education? Come to London Calling, it's the first of our panel series, at Broken City. Also, make sure to stop by MOCA for the opening of Spaces, featuring artwork of Bryce Evans, the winner of our Esty Contest. Get a look at the online schedule for up-to-date set times and don't forget to use our Mobile Version for access on the go. Keep up on and participate in all the Sled Island action! Follow us on Facebook, @sledisland on Twitter and Instagram and now on Vine! Connect with the others around the fest using #sledisland to share what's going on. Still not sure what to check out tonight? Here's a list of not-to-be missed shows! Get your pass now! A festival pass is your best bet to get the full festival experience. Festival passes are available online or at the pass pickup. Festival pass pickup is open daily until June 22nd from 10am - 10pm at the historic Fairmont Palliser (133 9th Ave SW) in downtown Calgary. Visit the shop for more information. We received the news today that Mac DeMarco has to cancel his four appearances at Sled Island due to a personal emergency. The festival hopes he'll be able to come back to Calgary soon. If you purchased a ticket to one of Mac DeMarco's shows, we are offering full refunds where requested. We will be reaching out to ticket purchasers starting tomorrow, but if you want, please do let shop@sledisland.com know. In the meantime, we'll be working to fill his four slots. Thursday, June 20th @ Golden Age Club - Night Marchers (highly in-demand Sled band featuring 3/4 Hot Snakes) replace Mac. The bill is now Night Marchers, Dent May, Lab Coast, Calvin Love. Thanks for understanding, festival-goers! We're as disappointed as you, but working hard to make the shows every bit as good as they would've been with Mac DeMarco in town! Confident they'll all be total parties. Sled Island 2013 Officially Begins! Last night's kick-off to Sled Island was an awesome one! Our green team was busy installing bike racks at venues across town, our annual Sled Island Poster Show went off at Milk Tiger Lounge, Sled Island Film had a great start to their week of programming and of course, the Kick-Off Party was a great time! It wasn't hard to tell people were feeling the vibe of Sled Island early on, come join in on the fun! The moment you've all been waiting for has arrived! The 2013 edition of Sled Island Music and Arts Festival officially starts today! We've got you covered with plenty of excitement for tonight including an early mind-melting performance from Polaris-nominated Colin Stetson at Commonwealth and the Calgary debuts of Swans at Dickens and Iceage at the No. 1 Legion. If you're looking for a party atmosphere head to Republik for the always-fun Hollerado, Broken City for the psychedelic sounds of Unknown Mortal Orchestra or HiFi Club for an all-out dance party with The Gaslamp Killer. As always there's tons of great music to discover during the festival. 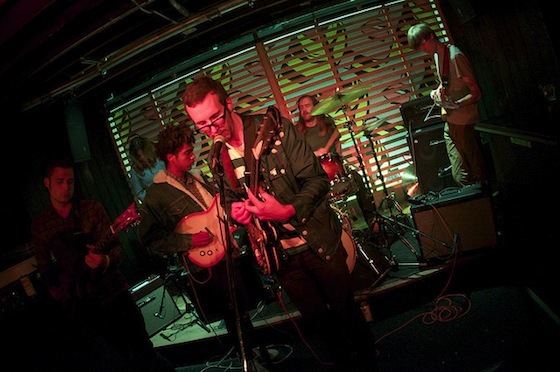 Look out for performances by Calgary's latest supergroup Viet Cong at the No. 1 Legion, delta blues crooner Iceberg Ferg at Wine-ohs and Edmonton-based popsmith Calvin Love at Commonwealth for the late show. There's lots more to check out besides just music, stock up on fresh produce at the Sled Island edition of the Hillhurst Sunnyside Farmer's Market, don't miss the art opening of Group of $even, the debut exhibition at Sled Island's first Contemporary Art Salon and pedal over to the Simmons Building for CSIF's Secret Cinema Bike-In w/ a yet-to-be announced French New Wave Classic screening tonight. Check the online schedule for a complete rundown of today's events and don't forget to use our Mobile Version for access on the go. Get your pass now! A festival pass is your best bet to get the full festival experience. Festival passes are available online or at the pass pickup. Festival pass pickup is open daily until Saturday, June 22nd from 10am to 10pm at the historic Fairmont Palliser (133 9th Ave SW) in downtown Calgary. Visit the shop for more information. Kick-Off to Sled Island 2013! It's the eve of Sled Island and we're getting this party started early! Join us tonight for the Nudie Presents Sled Island Kick-Off Show featuring a stacked lineup of locals including Teledrome, Gold, Samantha Savage Smith and HighKicks plus returning festival faves Chains of Love and Wild Rose Soul Club DJs to cap off the night. Don't forget to post your best party photos during the show and tag @nudiejeans and #sledxnudie for you chance to win 1 of 5 pairs of Nudie Jeans along with a Sled Island 2013 shirt of your choice! Start your night right at Milk Tiger Lounge for the 7th annual Sled Island Poster Show and get a first look at the 13 hand silk-screened posters each designed by a local artist for a specific artist and/or film at Sled Island 2013. Speaking of films, we've got a bunch of great ones lined up starting with Apocalypse: A Bill Callahan Tour Film following the pre-screening patio party at Broken City and Museum Hours screening at the Glenbow Museum. Check the online schedule to get up-to-date set times and don't forget to use our Mobile Version for access on the go. Get your pass now! A festival pass is your best bet to get the full festival experience. Festival passes are available online or at the pass pickup. Festival pass pickup is open today from 10am to 6pm and during the festival from June 19th - 22nd from 10am - 10pm at the historic Fairmont Palliser (133 9th Ave SW) in downtown Calgary. Visit the shop for more information. Sled Island is one week away! We're proud to announce the mobile version of the website is now available on all smart phone devices. Visit m.sledisland.com on your mobile device and follow the prompt to the mobile version of the website. Make sure to add the page to your home screen for quick access. Our mobile version was designed specifically for use on the go. On here you'll find access to the customizable schedule, venue locations and more. Special thanks to Structured Abstraction for designing the awesome-to-use mobile version, now available! Sled Island 2013 is right around the corner! We're happy to announce that Pass Pickup is at the historic Fairmont Palliser, located at 133 9th Ave SW. Pass pickup starts prior to the festival from June 14th to 18th from 10am to 6pm. Make sure to get your pass ahead of time to gain access to all the great kick-off events on Tuesday, June 18th. Pass Pickup carries on throughout the festival from June 19th to 22nd from 10am to 10pm. We're happy to provide the extended hours for those travelling from out of town and others coming in later than usual. Sled Island offers a variety of pass options to explore and discover the staggering amount of music and art. The Festival Discovery Pass provides access to all shows subject to venue capacity during the festival. A Festival Discovery Plus Pass provides all the same benefits with skip-the-line priority access (subject to capacity) and more! An All-Ages Pass provides anyone under the age of 18 with access to every single All-Ages show including both days at Olympic Plaza. The Film Pass is for those only interested in catching Sled Island Film events from June 18th to 25th. Festival passes and merchandise will be available at the Pass Pickup starting on June 14th at 10am! In the meantime festival passes are on sale now at the shop, order yours today! Sled Island is happy to announce that the Visual Arts lineup for the 2013 festival edition is now finalized! This year we received the strongest and highest volume of submissions in our 7 years of existence. Together, with the support of ACAD, Sled Island plans to feature a variety of art openings starting on Tuesday, June 18th. These include the highly anticipated Poster Art Kick-Off Show at Milk Tiger and exhibitions at established independent galleries such as Avalanche, Haight Gallery, and UAS. We're also proud to announce the winner of the nationwide Etsy contest is Bryce Evans; his artwork will premiere at MOCA on Thursday, June 20th. The festival will also feature some unconventional art spaces and site-specific installations at music venues throughout the festival, adding to the festival-goers' overall experience. We'd also like to mention that Art at Sled Island is setting up in Victoria Park to create a series of commissioned murals and make use of a long forgotten hair salon by transforming it into Sled Island's first Contemporary Art Salon. Check out the full Visual Art lineup page for more details on this year's program!